If you are an allergy sufferer, live with someone who is, or have been diagnosed with a respiratory ailment such as asthma, you may have been considering installing an air purifier in your home. An air purifier can help to reduce allergens and other triggers that cause respiratory problems. If you have been on the fence about whether or not to install an air purifier in your home, the reasons to go for it far outweigh any costs. Many homeowners rely on an air purifier to improve indoor air quality. 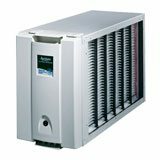 Air purifier systems are available with a wide variety of options and in a broad spectrum of price ranges. For some homeowners, simply managing dust build up and protecting their heating and cooling equipment is all they need. While a simple furnace filter can perform this function, an air purification system will do so more effectively. Indoor air quality equipment manufacturers such as Aprilaire offer air purification in three levels. Their Model 1000 series is best for homeowners looking to to protect hvac systems and control dust. The Aprilaire model 2000 series is for those who suffer from moderate allergy symptoms. For homeowners that have family members that have asthma or severe allergies, the model 5000 series offers the best solution. The premium Aprilaire model 5000 air purifier is really quite a marvel. When you compare it to the 1000 series you really get a lot more for your money. for example, the 1000 removes eighty percent of mold and pollen, eight-five percent of dust, and 50% of viruses. The 5000 on the other hand removes ninety-nine percent of mold and pollen, ninety-eight percent of dust, and ninety-four percent of viruses. Depending on your individual situation, you will need to choose an air purifier that best suites the needs of you and your family. If you are interested in learning more about Aprilaire products and indoor air quality, contact Polar today!